It follows Grant's AVA-101 “Lamington” schematic - I wasn't setting out to reinvent the wheel, just see how it would turn out. 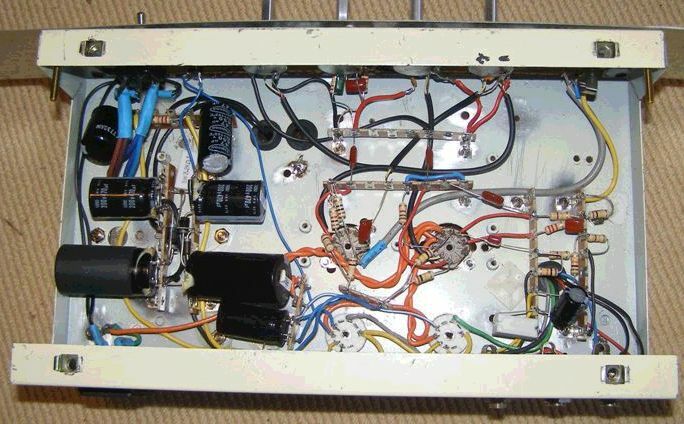 The build imperative is to get a decent, working amp while spending the minimum amount possible - so the caps came from PC PSU's, the tubes came from other amps etc etc...the chassis is an Epiphone Valve Junior that came from Bulldozed, had a Champ built into it, but then got gutted for this project. The faceplate is too thin - it is something I probably need to replace with something more solid, but it works for now I think. Also the 12AX7's will be hanging upside down without any support - a bit of a bummer that, but I can't do much about it. [*1] I'm not intending to take the amp outside the studio anyway, so it should be fine so long as I keep an eye on it. I'll be putting it into a combo with a 12” speaker I have here - in fact the impetus for this build was noticing that this speaker box I had appeared to have heaps of room for an amp. I should hopefully get it mounted tonight. It all fired up fine first time, but with a fair amount of hum and interference. I suspected the heater wiring was dodgy (my soldering iron tip crapped out when I was doing this stage) so I completely re-did the heater wiring and it has sorted out almost all the problems. *1 - Good valve cans are the best retainers, then spring saddles, both available from Altronics. Or make your own using a short length of wire formed with a loop to go over the top seal and two small springs. 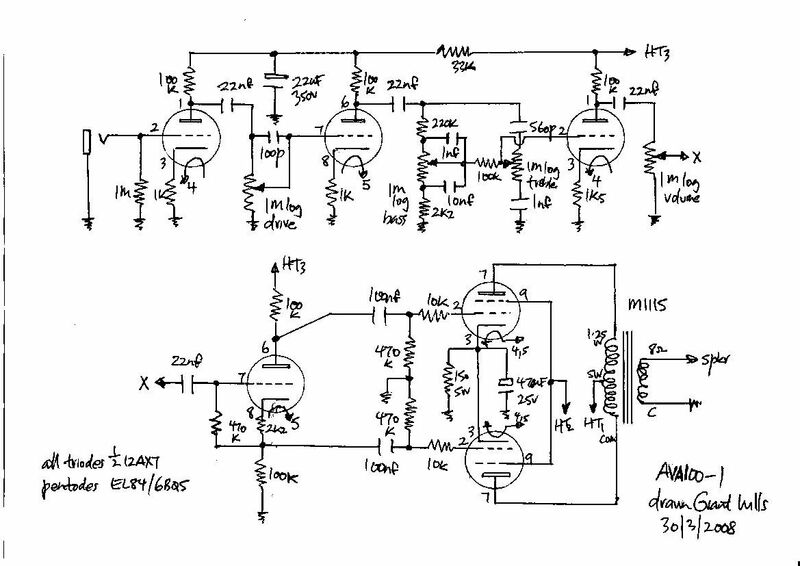 *2 - So far almost all the problems encountered building these amps have been due to layout. If this is anything like your first valve build stick to the layout shown. Do not resite major components, particularly the transformers. Do use good heater wiring practice. Do use single-point earthing as shown. The most likely causes of hum or instability are not following these guidelines. Please report any errors you find.